Iranians say that Esfahan is half of the world. The old capital of the Persian empire is still full of history with beautiful Persian Islamic architecture and a lively bazaar famous for their Persian carpets and other local handicrafts. Unfortunately my timing to visit Esfahan wasn’t that good. When I visited the famous Naqs-e Jahan square on my first night I noticed it was extremely busy. At the entrance of the mosque hundreds of veiled women with their children were lining up to get inside. There was a festive atmosphere and the women were carrying large bags with blankets, pillows and folded chairs. It was the start of the ritual Itikaf . For 3 days the people would stay in the mosques to pray and fast for the birthday of Imam Ali. Unfortunately it also meant that all mosques and the bazaar would be closed for the coming 3 days I was in Esfahan. But Esfahan is a big city with so much to see and do that despite most things being closed I did not get bored one minute. I can only imagine how rushed my schedule would have been if everything was open. Every day I left in the morning to walk around town and before I knew the sun was setting. Even tough I couldn’t go inside the mosques, the outside was just as stunning and I often met many interesting and friendly people on my way. The city is also full of parks that are a welcome respite from the city’s crazy traffic. I spent two full days in Esfahan and it was simply not enough for this lovely city. But you always need a reason to return to a country. The square alone can keep you busy and amazed for a full day. With every visit I discovered new details. From the blue tiled entrances of the mosques, the Ali Qapu palace to the shops and restaurants surrounding the square. Time flies when you wander around here. Unfortunately this blue mosque at the square was closed. I could only marvel at the outside decorations that give a taste of the beauty inside. Luckily the Sheikh Lotfollah was the only mosque that was open. This mosque was used for the harem of king Shah Abbas and is no longer functioning. The mosque is small, but entering the inner dome takes your breath away. When the sun sets down and you look above you at the center of the dome the light gives you the illusion of seeing a peacock tail. If I hear beryani I think about Indian rice, but esfahan’s Beryani has nothing to do with Indian food. Instead it is a dish made of minced sheep’s lungs and intestines. They serve the meat in a rolled bread with some fresh herbs. The bread and herbs were delicious, but the meat patty was greasy and had an interesting taste. I felt full for the rest of the day and this was not the best food I had in Iran. The cooks were so excited about a foreigner eating Beryani that it was still a memorable experience. On my second day I accidentally bumped into a Dutch couple I met earlier in Kurdistan. They were there with a friend who was showing them around in Esfahan. I decided to join them on a walk to the Ali Gholi Agha Hamam. Esfahan is home to two palaces, both surrounded by beautiful Persian gardens that are worth visiting. The park around the Hasht Behesht palace is free to enter and much of the palace can be seen from outside. To enter the Chehel Sotun palace gardens you need to pay the entrance fee. The gardens are quite similar to those of the free gardens of the Hasht Behesht palace, but the palace itself is much bigger. Another area worth visiting is the Armenian quarter. There are several Armenian churches here but the most beautiful one is the Vank cathedral. Unfortunately the cathedral was also closed during my visit, but still it was interesting to walk around the christian neighbourhood that had a very distinct atmosphere. Some of the smaller mosques were still open for visitors such as the Ali mosque. With so many mosques in Isfahan it is easy to overlook this small mosque, but I found it quite interesting as it has a small shrine next to it and you can see the Ali minaret. The oldest and largest minaret in Esfahan. Another mosque that is worth visiting is the Hakim mosque. This is the oldest mosque in Esfahan. As it was closed I could only see the outside of the mosque that has some beautiful carvings and patterns. This mosque was also closed, but I managed to be allowed a quick sneak peek in the women’s section. Outside they were giving away free drinks to people as a religious duty. Even tough most of the bazaar was closed, some sections close to the square were open. Strolling through the empty alleyways also allowed more focus on the details of the buildings. Hidden domes with tiles, coloured mosaiques and small shrines. 13. Join a picnic in one of the parks. 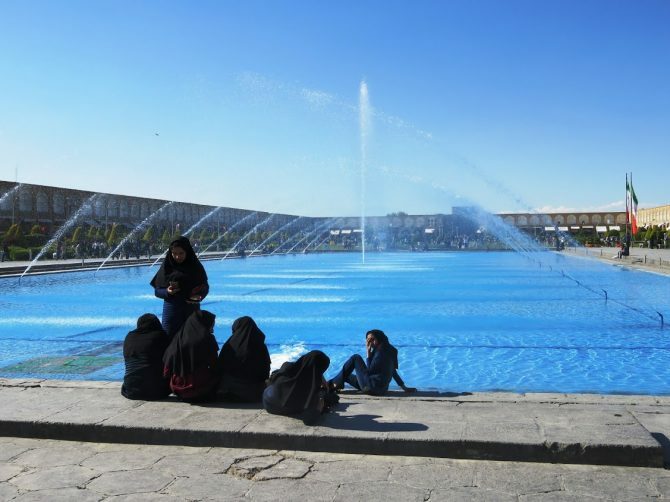 Most people in Esfahan enjoyed their time off having a picnic in the parks and banks of the river. Having a picnic is a serious business in Iran. Extended families go out with complete barbecues and tents occupying every space available. You will have no shortage of invitations to join them for a cup of tea. I was lucky, because there was actually water in the Zayandeh River. In two weeks the riverbed would be dry again. Apparently the municipality is controlling the water flow. For now, people enjoyed their time at the river banks and the famous bridges of Esfahan. Both nights I spent hours at the famous Khaju Bridge where men gathered to sing. My hostel owner recommended me to visit Soffeh mountain park at the outskirts of Esfahan. Another popular picnic spot for Iranian families. What makes this place special is the view over the city of Esfahan. 16. Meeting the friendly people in Esfahan. I had so many nice encounters with the people in Esfahan. A woman who tried to couple me to her son in Holland, a girl who explained how she had to wear more conservative clothes because she would otherwise lose her job as a teacher, a girl who felt sad she could not go into the mosque for itikaf, the cook of the beryani restaurant that asked my advice in attracting more tourists, students that wanted to interview me for their study projects, the girl that gifted me her manteau because i told her i liked it and a student who was in delft for an exchange project and was now asking me for relationship advice on how to woo his dutch lover. I can say that my time in Esfahan was mostly about meeting lovely, friendly and inspiring people. Nik Hostel : Nik hostel has two rooms. The owner is very friendly and helpful. Such a beautiful place! The architecture is incredible!! What lovely mosques – and you photo of Khaju Bridge is magnificent! Wow, this is incredible! Were people going to stay in the Naqs-e Jahan square? It looks like some have suitcases with them. Great that you were flexible with your plans and were able to find other things to do! Super helpful and informative post, thanks for sharing!